You must make reservations at least 5 minutes in advance of the time at The Grill Room at The Fairmont Chateau Whistler. Deserving of more exclusive surroundings? Enjoy the rich decor and spectacular scenery while you celebrate intimate gatherings in the Private Dining Room. Nestled at the foot of Blackcomb Mountain, this private dining room accommodates up to 24 guests. A MODERN CLASSIC - Surrounded by cherry wood cabinets, and featuring the finest wines of British Columbia, you will find that each dish integrates regional ingredients with seasonal influences such as Alberta's Spring Creek grass fed free range beef, Ocean Wise Seafood, and organic produce grown by our local farmers. Our culinary team focus on bringing the best of British Columbia to share with you. 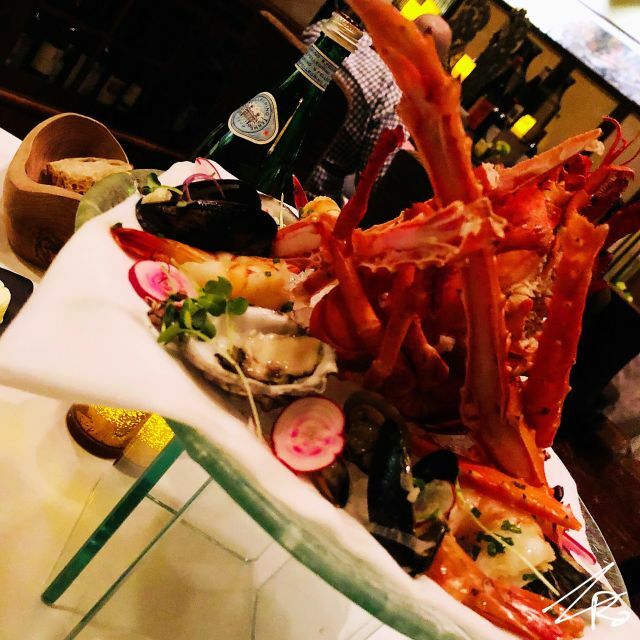 You will feel welcomed with warm and attentive service, whether it be a romantic dinner for two, or a night out with friends. Good enough for a every day dinner with family and friends. Food is ok but not very expensive. Restaurant was great but $40 for valet parking is outrageous. We were running an hour late, informed the restaurant. No problem sir. Cosy setting with a log fire set into the main wall. I opted for a steak, two recommendations were wheeled to the table for me to make a decision on which steak and what size. Nice touch. Shared a plate of oysters. Lovely. Decent bottle of red to go with the steak. Also lovely. Skipped the dessert. Jet lag from the UK got the better of us. The service and setting were excellent. We shared the Waygu beef between 3 and it was superb. My wife had the catch of the day which was Halibut which was also excellent . The restaurant was slightly noisier than I would have liked due to a large private function which then came in and took up two large tables. If you are dining here then definitely try the steaks. Fabulous from the moment we were greeted at the front desk- our waiter was so attentive and listened intently to all our questions and requests. We were entertaining in-laws from Europe which could have been nerve wracking, but we ended up getting accolades for our choice. Lots of steak choices- rib eye was perfectly done. My husband continues to talk about the stuffed carrot appetizer. Slow elegant perfectly timed service and a quiet beautiful dining room. Gave 4 stars on value as 3 of us had Kir Royales to start. It was a surprise that they used Moët for $39 per glass! (They were delicious) Otherwise 5 plus stars all around. The food was very good, and the service (for the most part) was also reasonably good. It was a little slow as our server also appeared to have several large tables. They rocked! Impressive service, presentation, and taste. Great food, great atmosphere, dry aged ribeye was fantastic! The 6yr old and a 9 yr old in our party can not wait to return, thanks to our great server from Peterborough. I love this place. That being said this was the first bad meal I have had here in over a decade. Two steaks at the table were significantly over done. When one came back, was underdone. Lots of kitchen errors in the room that night. Waitress was incredible and went above and beyond to make up for it. Will give them one more chance. We were greeted and seated immediately. Our servers were extremely nice, friendly and sweet. Especially I liked the sense of humor and the attitude from the waiter (who is originally from Germany, sorry I forgot his name). He and his personality made our experience much better... The food was delicious, especially the tomato soup and Wagyu steak. Unfortunately the Dungeness crab cake was not impressive... at the end we had very unpleasant experience with the taxi. We waited for over one hour and the staff didn’t offer anything till we had started explaining. 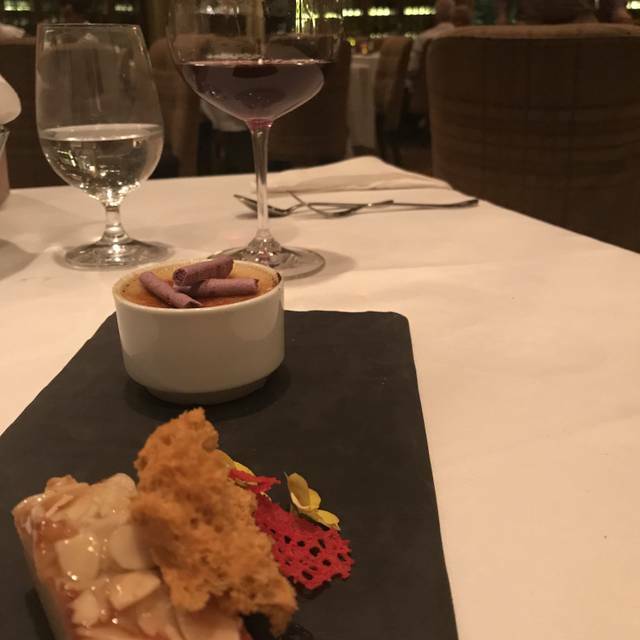 Honestly, in my opinion when people come to have such dinner the hotel and restaurant should take care of their full positive experience. It wasn't the cheapest place, but it is fine dining. Everything was great and the staff were very attentive! We were a bit disappointed. We have dined at many fine restaurants so were expecting better. Plus is the staff were lovely, and the food tasty but there were a few details that were lacking. The pork belly wasn't crispy. The meals very small for the price. Lovely tenderloin steak though but was more like $50 than $64. Our water glasses were not refilled. It did not feel value for money. As fine dining should be an experience not just a nice meal. Amazing food and the service was incredible. The chef will come out and explain where the meat is from and allow you to pick your own cut. 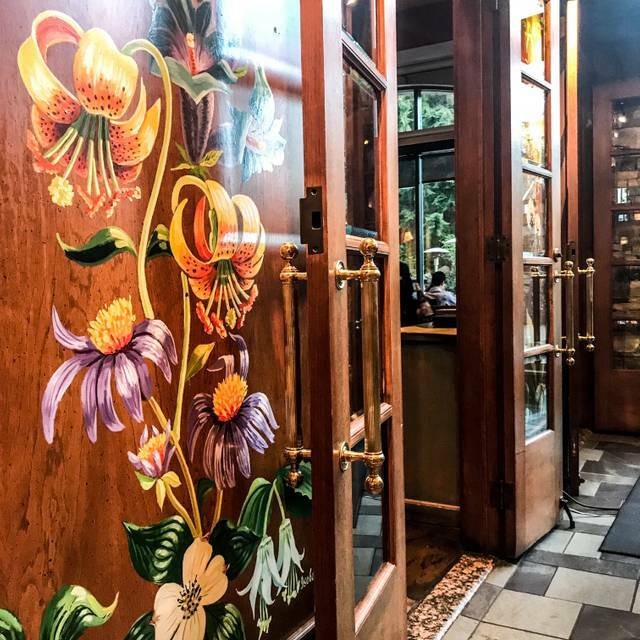 This place should be on your bucket list of places to eat in BC. Service was superb,knowledgeable attentive and friendly . And relatively quiet,unlike a lot of the hip places down in the lower village. It was a top evening in our ski holiday. Wonderfull service crew. Birthday surprise and very good mood included. Special thanks to German staff and chief of restaurant. 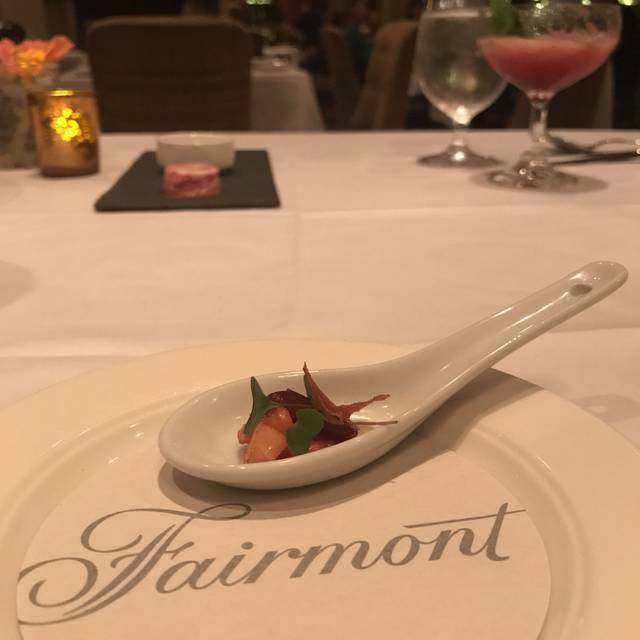 It’s always a pleasure to dine at the Fairmont and this visit did not disappoint. The aged beef was excellent. The food was not as good as I expected. It wasn’t bad, it was just average. The ambiance and service is excellent. The food didn't meet our expectations. For some reason it was a long wait between courses but that's probably not typical. They comped our desserts for the long wait eventhough I had not complained, which was very thoughtful. The waiter was excellent and the room is beautiful. Based on their pricing and the food presented I do not feel I would go again. Awesome table next to fireplace. William was extremely attentive but not intrusive. 45 day aged, no antibiotics and no steroids, beef was perfection. Husband gave the salmon high marks. Mushroom side dish was tender, but not tasty. The creme brûlée with coffee flavor was like cappuccino on steroids! To die for. Best birthday ever! I cannot say enough great things about the waiter we had at the restaurant. He was probably the best waiter I have ever had at a restaurant. We (my husband and I) went to Whistler for vacation and brought our 4 1/2 year old daughter and my mother in law with us. This was the last place we dined at during our trip and we definitely saved the best for last. My husband and I have been here two other times over the last four years. This time the waiter bent over backwards to help our daughter have fun in a fine dining restaurant. He was exceptional. The food was exceptional. This is a restaurant that should not be over-looked during your trip! You will fall in love with it. The steak was flavorless, I would not recommend this restaurant for steak. My bone in rib eye was flavorless as well as my friends filet. Nice setting but unfortunately the food was just awful. My steak (ordered medium) came out well done to the point where I literally could not cut it with a steak knife. The server acknowledged that it was incorrect and was very willing to prepare a new one but at that point I did not want one. My wife's salmon was also severely overcooked. A very big disappointment. 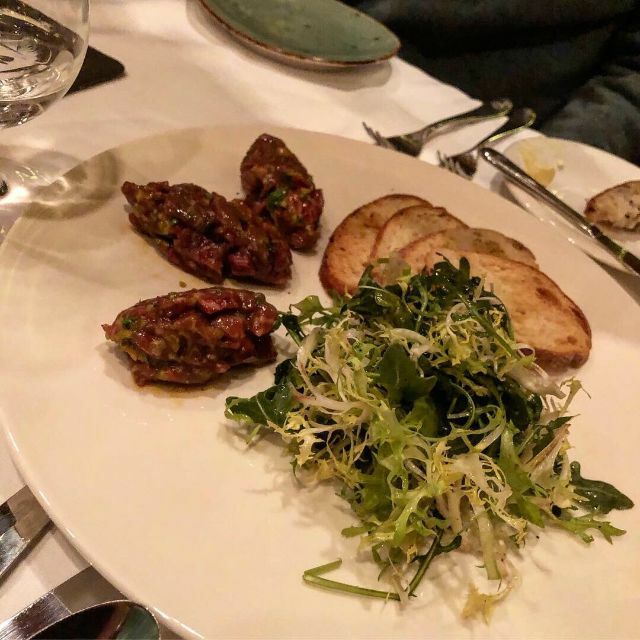 I and my wife went to the Grill Room at the Fairmont to celebrate our 10 year wedding anniversary. This is the best restaurant I have ever been to. Everything was perfect, from the delicious food to the friendly service. We ordered a dry-aged (35-40 days) Pemberton Meadows Rib eye steak and Brant Lake Wagyu Beef. The steak was just delicious! Our waitress and host were very friendly and the service was just impeccable! We had a great dinner! We would definitely come back again and recommend it to all our friends. 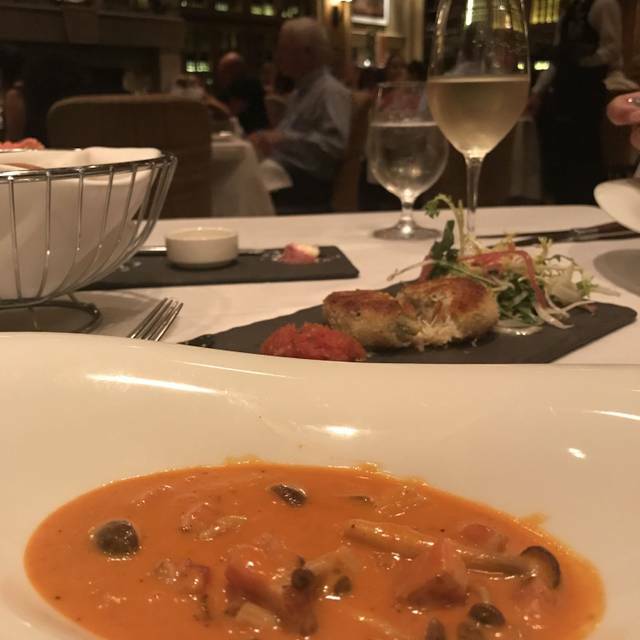 Exceptional service and quality of food in an intimate environment. Absolutely fantastic and beautiful restaurant! The service from the minute we walked in was fantastic right up until we left, as we were walked out to our ride. 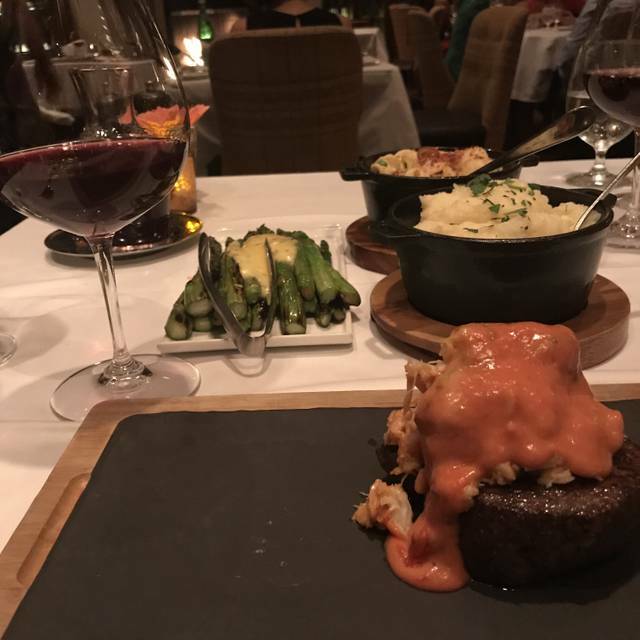 The food was exceptional along with the service. It was not a cheap meal but I do think it was worth it given the quality of the food and the atmosphere. 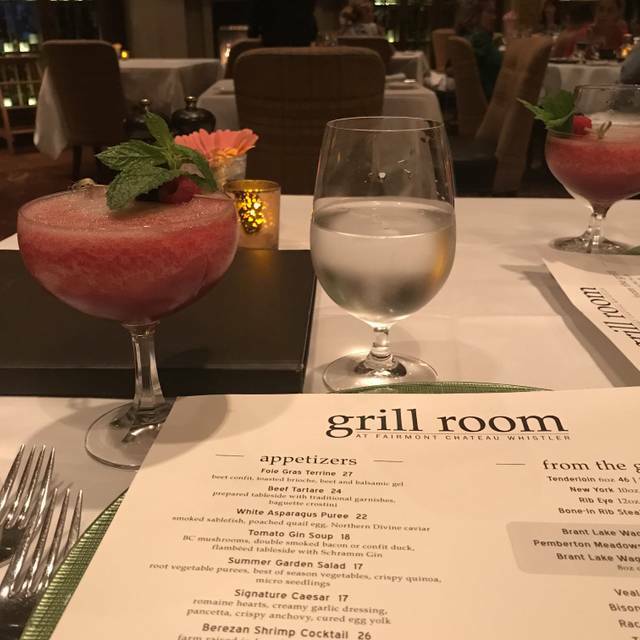 I would recommend The Grill Room if you are celebrating a special occasion with friends or just a night out. We celebrated our birthdays while vacationing in Whistler. It’s was a fabulous experience. We were seated in front of the fire on a cold night. The waitress was friendly, helpful and aware of the farms providing the food available to us. The food was delicious and cooked perfectly. Ambiance was perfectly cozy. We had a wonderful dinner experience. It was our 50th wedding Anniversary. We were treated to the dinner by our children and families. On approaching the Fairmont the outside decorations were wonderful as were the interior. It was all dressed up for the Christmas holidays. The staff at the restaurant reception were very friendly and polite. They all wished us a Happy Anniversary. At our table we met our wonderful server "Alex" she was very friendly and professional and made us feel very much at home. There were other diners and one large group in the adjoining private room but that just added to the ambience. The food was excellent. Alex made our gin tomato soup at the table and it was delicious. The main courses too were excellent and we were very satisfied. To top it off Alex brought us a complimentary dessert. 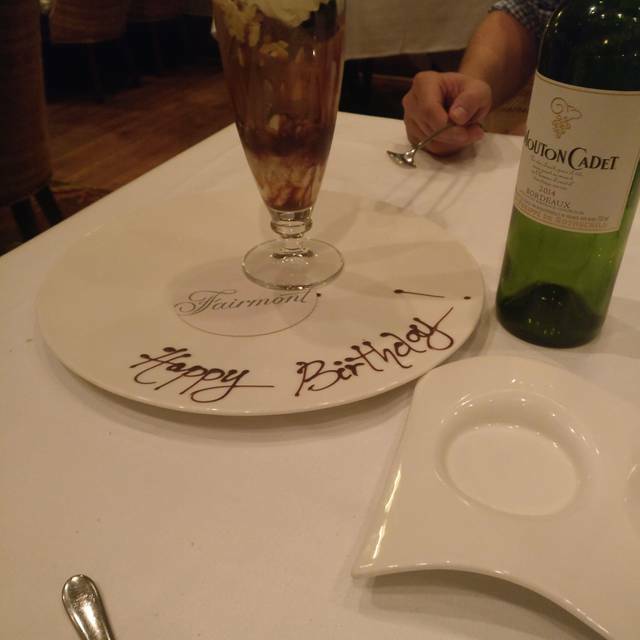 The presentation plate had "Happy Anniversary" inscribed in chocolate. Thank you to all involved at the Fairmont Grill for an evening to remember. Best dinner experience I've ever had. Went there for my anniversary and it was truly amazing. I'm gluten free and they were kind enough to include me in on what my partner was able to have. We both got steak and you could taste the quality. Quite an expensive meal but you truly get what you pay for. I would recommend for special occassions you won't be disappointed!